He’s won personal honors: Recipient of the SoCon Dave Hart Graduate Scholarship. Induction into both Phi Beta Kappa and Golden Chain. And there’s his soccer record: All-SoCon Second Team last year, as he helped boost the Spartans to a second straight regular season title. Eighteen career shutouts (so far), putting him in the top-10 all-time in the SoCon. Leading the SoCon in 2011 conference play with a very low 0.14 goals against average. They did just that in 2010, he points out, as they took the SoCon Tournament. And they’ve had some notable victories since then. “We beat Duke last year.” Duke was ranked No. 12. This year they’ll face a tough slate. Home contests include NC State, Clemson and 2011 NCAA College Cup finalist Charlotte. In all, five NCAA tournament teams from 2011 appear on UNCG’s schedule: Charlotte, Coastal Carolina, Duke, Elon and Furman. Our goal? To win the SoCon and get ourselves in position to get into the NCAA tournament. He entered the season earning pre-season first-team All-SoCon honors, as did two teammates: junior defender Aaron Reifschneider and senior forward Hakan Ilhan. At the same time, Ford has been focused on his first year as an MBA student, at the Bryan School. He particularly looks forward to the opportunity to be seen by potential employers. He explains that political science is applicable to many jobs. It’s not just the facts – but also the soft skills you learn – that can make a difference in your career. Ford graduated in May. He got married this summer, to fellow Spartan Caitlin Snelgrove. 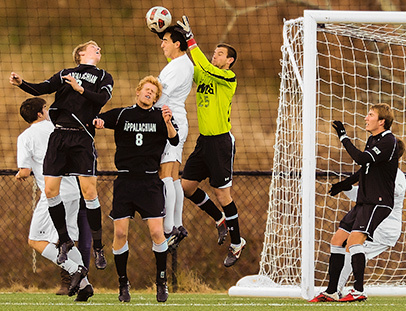 And now he enters his final year as goalkeeper for the Spartans. And his first as a graduate student. Who’d want to be anywhere else? Admission is free for 2012 UNCG home soccer matches. Enjoy fireworks after the match with N.C. State Sept. 7. See the full schedule.